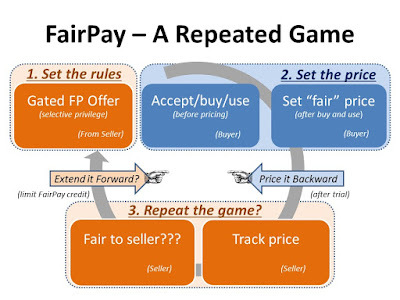 The radically new FairPay pricing process is particularly relevant to the continuing dialog suggested by "Business Model Generation," the recent book by Osterwalder and Pigneur. The book is aptly self-described as "a handbook for visionaries, game changers, and challengers striving to defy outmoded business models and design tomorrow’s enterprises." That is also the focus of the book's companion Web hub for ongoing discussion and development. Very much in that spirit, FairPay is a radically new kind of pricing process that combines the flexibility and participation offered to buyers by "Pay What You Want" (PWYW), but with the hook of consequences that make it fair to sellers. It works where there is a subscription or other ongoing relationship of continuing sales, by tracking how fairly each individual buyer pays over a series of transactons. FairPay is particularly well suited to the Internet and digital media, for which "outmoded business models" are loudly crashing and burning, and for which it is all too clear that new designs are urgently needed. Fairpay is described at the FairPay Web site and on this blog. This post seeks to frame the FairPay concept in the context of The Business Model Canvas that underpins that book. In fact, the adaptive and dynamic nature of FairPay is itself a process for generating the details of business models (because it can take on the characteristics of many different models), and thus can help bake this idea of business model generation into core business processes. Given this deep and broad impact, I suggest that FairPay offers a new business model "Pattern." FairPay lets you (the buyer) Pay What You Think Fair, and do so after trying the item -- and is thus very fair and appealing to buyers. Sellers track feedback on each buyer’s pricing to establish a FairPay pricing reputation for that buyer, and use that reputation to decide whether to make further offers, and thus manage their risk of being treated unfairly. This dynamic makes FairPay fair to sellers because it lets them manage their risk of unfair prices -- and the cycle of offer=>price=>feedback=>offer creates consequences for buyers that motivates them to pay fairly. FairPay solves the conundrum of pricing, by treating pricing as a process, not an endpoint. The overall result is more sales, at more fair prices, yielding much happier buyers and sellers, and a more effective economy at large. how the buyer sets the price--and explains his rationale for why he considers that to be fair. Thus FairPay offers an open-ended framework that can be adapted to almost any kind of pricing metrics and behavior desired. 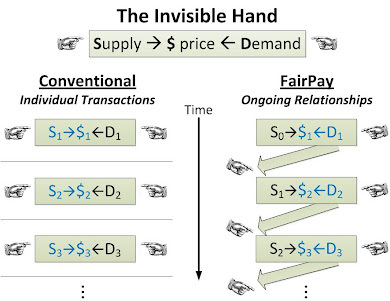 Customer Segments: The dynamically adaptive nature of FairPay enables pricing to be individually tuned to "customer segments of one" in advanced uses, or in simpler versions that are framed to mass markets, niche markets, arbitrarily segmented or diversified markets, and to adapt to multi-sided platforms (such as individually varying mixes of paid vs. ad-supported). Customer Relationships: This dynamic segmentation is intimately tied to well-managed, ongoing relationships driven by this cycle of offers, offer framing, pricing, and price-related feedback. 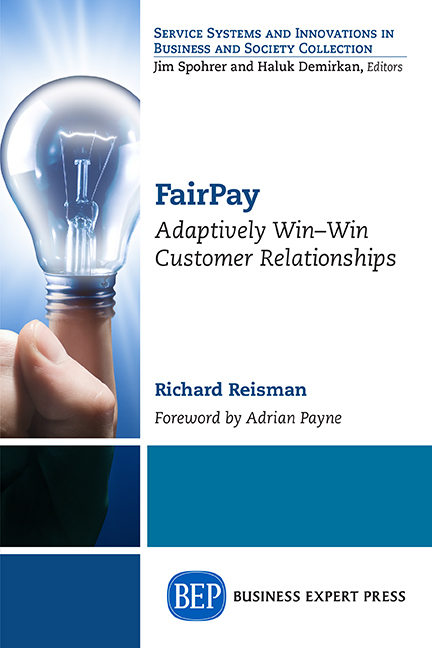 FairPay encourages and builds on the movement toward "relationship marketing" and the Cluetrain principles of "markets as conversations." Channels: The emphasis on pricing processes as relationships feeds back into nearly all aspects of channels, with strong impact on a the touch points of awareness, evaluation, purchase, delivery, and after-sales. Value Propositions: The central issue of fairness links directly to the value proposition. The heart of a well-executed FairPay pricing process is the ability of the seller to highlight the important aspects of the value proposition being offered, and of the buyer to price in accord with how the buyer perceives that value proposition, in terms of any and all dimensions of value (the "aggregation, or bundle, of benefits") that either party considers relevant. Cost Structure: The FairPay revenue streams naturally link to the cost structure, and do so in a way that is more dynamic and adaptively-driven than conventional revenue processes. Buyer fairness would be defined by both value and cost considerations, and the dialog cycles can be framed to ensure that costs are fairly reflected in considering value promised and delivered. FairPay can be expected to be particularly well suited to Value Driven businesses, and those where Variable Costs are low (and those with Economies of Scale and Scope). Key Activities, Key Resources, and Key Partners: The FairPay processes feed back to signal what products should be produced and offered, in what form. This is much the case with any pricing process (as how economics matches supply with demand), but the uniquely dynamic and adaptive nature of FairPay processes can enable new levels of adaptation back into the production side. In extreme cases of mass-customization, FairPay feedback can be applied directly, to dynamically shape just what product and/or service is offered to individual buyers, and to the aggregate of buyers and potential buyers. So, as suggested, FairPay processes offer not only a new and better way to do pricing in many contexts, but one that inherently links to all other business processes in a way that makes doing business a far more flexible and generative process. The way to generate a business model in the Internet age is for the business to be one that dynamically and adaptively generates its own right model, a model that optimizes value creation for both seller and buyer, for each relationship as it evolves. can you give an example of a company that applies this or similar model? I am not aware that anyone has yet automated the process over a relationship (over multiple transactions), as I suggest, although many companies I have spoken to are interested in doing that. Single transaction PWYW is common, and Humble Bundle is one of the most advanced. As a manual example that does work informally over a relationship, consider the case of tipping in a restaurant that one frequents. Maintaining a good reputation is part of the motivation to tip well, and servers may well limit what service they provide to those who they learn do not tip fairly. The challenge FairPay addresses is to devise the processes and decision rules needed to make that kind of relationship work on a large scale, automated basis. But I should note that similar value-based approaches that impact the Business Model Canvas in similar ways are highly successful in many B2B contexts, as outlined in my later post: Value-Based Pricing Is Transforming B2B -- Now for B2C... (http://bit.ly/FPZvbp). Whether you have a blog and want to increase traffic to your blog, or whether you have a website and want a blog to high citation flow backlinks to your site or business, then you must use blog backlinks. One form of backlinks are for those who have a blog and want to publicize it even more. When sampling potential coaches for any business,https://mailchi.mp/cc08635ff53e/solopreneursguide key to make sure those with the best fit for your business are the target. If you are a creative-artistic entrepreneur - your need for a Business Money Plan (or commonly referred to as a Budget) is a necessity for your best additional hints creative good. This isn't just for reasons of some business advisor or accountant telling you that you need it - you should want to need and rely on it as part of your "creative stream."